It was the 8th inning. Felix Hernandez still out on the hill, having given up just 4 hits to the Yankees in the prior 7 innings of work. One of them a Curtis Granderson homerun in the first inning, another, an Ichiro Suzuki double. Felix was working through innings, giving up an unusually high amount of walks. 3 base on balls versus his 4 strikeouts. After Ichiro's double in the 5th, Felix ended up hitting Ichiro in his next at bat in the 7th inning. The pitch was a slider that ran down and in and hit Ichiro in the right foot. Felix turned away immediately as to not look at Ichiro at all and there was nothing said by either of them. Just an accident. In the 8th inning, Derek Jeter came to the plate and took a first pitch fastball to the rib cage from Felix. Jeter went down to first base and moved to second on a wild pitch to Curtis Granderson who ended up striking out. With one out, Alex Rodriguez worked himself to a full count and Felix threw the 6th pitch of the at bat up and in on A-Rod and hit him in his hand. It looked as though it went off the knob of the bat but Alex went down to the ground and was writhing in pain and wound up leaving the game holding his hand still as the trainer escorted him off the field. Jeter, A-Rod and Ichiro. A combined 8,619 hits between the three of them and Felix added three hits of his own to their books in a matter of two innings. There's some nostalgia for you. I would hate to say that any of it was on purpose, but, who am I kidding? I hope every one of them was on purpose. After Ichiro hit the double off of Felix, he needed to be reminded who the King was. Just cause you play for the Yankees doesn't mean you're all that Ichiro. Take that! Oh yeah, and Jeter, that goes for you too and your "pretty boy" friend. Is it a coincidence that it happened to be those three players? I think not! The Mariners and Yankees were tied 1 -1 after the first inning when Granderson hit his homer and then Michael Saunders hit a solo shot of his own in the bottom of the first. The M's would take the lead for good in the third inning on a Jesus Montero RBI single that scored Brendan Ryan from third base. Then Saunders scored on a John Jaso sac fly to make the score 3 - 1 in favor of the Mariners. Things got interesting in the top of the 4th when the Yankees loaded the bases with only one out. 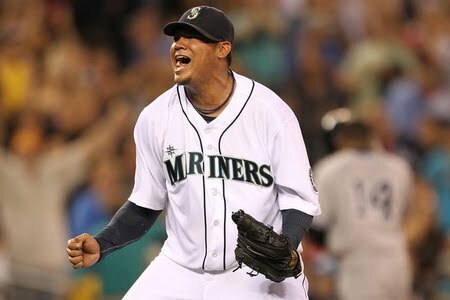 Felix coaxed Raul Ibanez to strike out and got Eric Chavez to line out to center. Then in the 8th, with Jeter and A-Rod being hit by pitches, Eric Wedge went to the pen and got Lucas Luetge. Luetge gave up a single to Robinson Cano to load the bases and then gave up a sac fly to Mark Texiera before striking out Ibanez. That made the score 3 - 2 Mariners. The bottom of the 8th the Mariners tacked on an insurance run. With two out and Dustin Ackley aboard via a walk, Ackley stole second. That forced the Yankees to intentionally walk Montero and face John Jaso. Jaso walked and the bases were full of Mariners. Kyle Seager came to the plate and hit a check swing bunt that rolled down the third base line and allowed everybody to advance 90 feet as Ackley scored from third. Mariners 4, Yankees 2. Tom Wilhelmsen came in and closed the door for his 11th save and gave Felix his 9th win on the year. The Mariners have now won 6 of their past 9 games and that mainly due to their pitching. The offense continues to struggle with just 6 hits tonight, but they held the Yankees to only 5. Quite the game, quite a story and the greatest thing about all of it is, we got to dangle Felix in the face of the Yankees again as he gets the win. How sweet it is!! !